Building the foundation with Ann Hechle’s teaching cards as our blueprint, we will look at the letter families to see how they are constructed. Then we will put on our hard hats and start writing. This will be precise and controlled. Our guides: foundational exemplars of some of the “master builders” — Ann Camp, Charles Pearce, Sheila Waters, Edward Johnston and Christopher Calderhead. Bring these supplies: Slant board, Speedball C-2 or Brause 3mm nib, pen holder, 2.4 Parallel Pen, writing fluid of choice, layout paper 8½ x 11 or 9 x 12, T-square or ruler, 1 colored pencil, 1 graphite pencil. 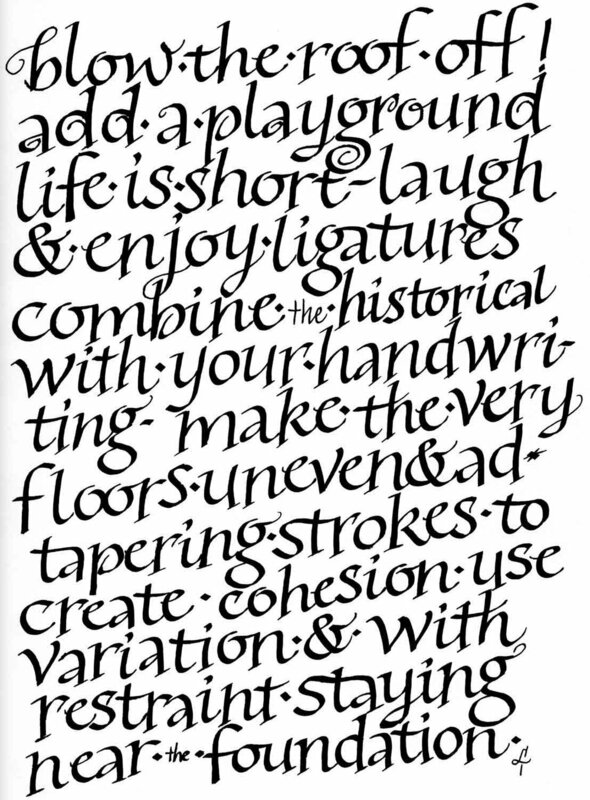 Kris MacDonald began her calligraphic journey in her high school art class, practicing by writing letters to neighborhood friends serving in Vietnam. Later as an elementary school teacher she coached her second and fourth grade students in handwriting. She was a dedicated student of Colleagues member, Sharlene Jacobson, finally taking all of Sharlene’s community education classes. For 22 years Kris and fellow-member, Katie Beery, ran the Hall of Scribes at the MN Renaissance Festival where they demonstrated, taught, sold their calligraphy and created award certificates. 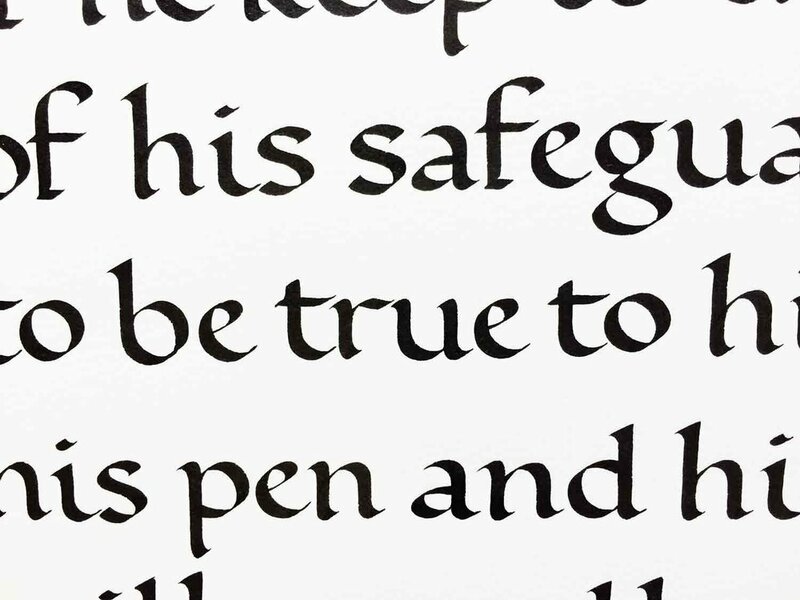 Kris has attended 10 international calligraphy conferences and now teaches calligraphy at Minnesota Center for Book Arts, Minnetonka Center for the Arts and Hopkins Community Education. Currently she is our Colleagues librarian. Lori Tews is a long-time lover of letters – a calligrapher who illustrates, paints and designs for private commissions and corporate clients. Lori loves the combination of words and art, meaning and interpretation, form and thought, communication and the advantage that calligraphers rarely get arrested! Her favorite tools include the ruling pen, folding pen, broad-edged nib, pointed and flat brushes, found objects, vintage pointed nibs and bass wood. The pinstriping and lettering on a passing motorcycle, car or double semi may have been done by Lori. She began studying calligraphy in her 7th grade art class and has not looked back. She teaches a variety of lettering classes at Wet Paint Artists’ Materials and Framing in St. Paul and is team-teaching there in Fall 2017 with internationally known calligrapher/designer, Michael Clark.